Welcome to our 4th Grade Math Problems. The 4th grade math problems on the sheets are longer math problems designed to encourage children to use a range of math skills to solve them. At fourth grade, the problems are starting to become more advanced with children needing to become more systematic in their approach and experimenting using trial and improvement strategies. Many of the problems have addition 'What if ...' questions with them to extend learning and get children looking for alternative solutions. 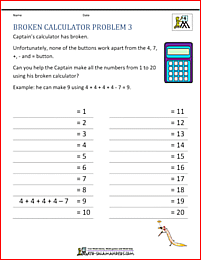 Captain Salamander's Puzzling Problems involves using thinking and reasoning skills to work out two math challenges. The challenges also involve an element of trial and improvement. This sheet is available in standard and metric units. The Broken Calculator problem is a number problem involving using an imaginary broken calculator with only the 4, 7, +, - and = buttons working to make different totals. Quadra's Magic Bag Challenges involves using thinking and reasoning skills to work out two math challenges. The challenges also involve an element of trial and improvement, and also some addition. Tyger's Fishy Problems is a 4th grade math problem which involves using thinking and reasoning skills to solve two money challenges. This sheet is available in both dollars ( &dollar; ) and pounds ( £ ). Bruno's Bones is an activity to encourage children to work systematically to find the number of bones that a dog called Bruno has buried in his garden. This is a good problem for using lists/tables to solve and also counting in single digit steps. Don't Be Alarmed is a sequencing problem where a burglar alarm is switching different lights on and off at different times. It is good for developing mathematical modeling and using lists/tables to help solve problems. Four Dogs Problem is a logic problem which involves using the clues to work out the owners for each of the four dogs. Fox vs Rabbit is an another mathematical modeling activity which involves looking at the routes of a fox and a rabbit and working out at if/when the rabbit is likely to get caught. Frazer's Wall is a trial and improvement activity which involves trying to work out the number of bricks that were laid in each day to make a set total of bricks. This problem can also be solved or modelled using algebra. Make Me 100 is one of our 4th grade math problems designed to test children to find ways of making the numbers from 1 to 10 make 100 using different operators. It is good for developing perseverance and also for reinforcing the use of brackets of PEMDAS. Sally's Fruit Punch is a money and scaling activity. The aim is to use the information to work out how much ingredients are needed. The ingredients then need to be priced to work out a total cost. Share the Treasure is a fraction sharing activity where the aim is to work backwards to find out how many bars of treasure the pirates had before they shared them all out. It is a good activity for developing fraction problem solving and working backwards. Something Fishy is a money problem which involves working out exactly how many of each fish were bought in order to have spent $150 on the fish. It is a good activity for using lists and tables to find all possibilities. The Rock Race is a 4th grade math problem which needs some perseverance to complete. The aim of the activity is to try different routes around the 6 rocks to determine which route is the shortest. Who Caught the Biggest Fish? Who Caught the Biggest Fish is a logical number problem where you need to use trial and improvement strategies to work out the order of size of the fish from the clues given about their weights. 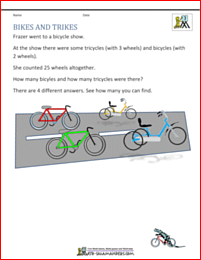 We have a range of easier word problems on our 3rd grade math problems page. 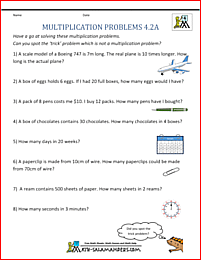 We have a range of more challenging word problems on our 5th grade problem solving page. Some of the problems, e.g. The Rock Race and Sally's Fruit Punch and Frazer's Wall have harder versions on this page. Looking for some more fourth grade math word problems? Here is our set of 4th grade math word problems to help your child with their problem solving skills. The following games involve different 4th Grade Math activities which your child will enjoy playing. Games include using negative numbers, decimal addition and subtraction, rounding, multiplying by 10s.